Start your own guild and choose its members, motives, and location. I got this and made the ''Republic of Skyrim People's Army'' and made an army that fought the Empire and storm-crocks. I made soldiers and recruited other N.P.Cs who are mistreated. 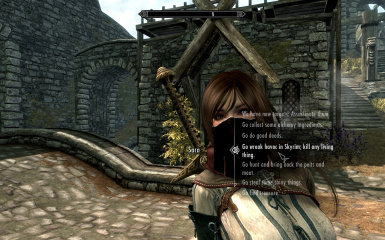 I recruited the Grey Beards and Jarl Ulfric and told them to go kill any living thing. Best mod ever. I figured out you can recruit dogs into guilds. So I made a guild of dogs. Exclusively dogs. Yeah. Quicksave and reload the quicksave. It’s all in the name. That’s right, with Guild Starter, you can now start your very own guild. Recruit almost ANYONE to join a guild commanded by you. Once you've found a nice home base(aka headquarters) and recruited up to 10 guild members, the possibilities become endless! Send your guild members on jobs, have them follow you, and level up your guild. Be a hunting guild, a necromancer guild, a mining guild, a cooking guild, an apothecary guild, an archer guild, a fight club, an assassin’s guild, a bandit clan, a treasure-hunting guild, a group of skooma smugglers, a paladin guild, and the list goes on infinitely. I've put many many hours of work into this mod, heck, I’m writing this at 2:35 AM because I've been working on it all night. So download, endorse, and make YOUR guild. 1. Find a good place in Skyrim for your guild headquarters. Talk to your recruit and say “I have a job for you”. Then choose any job from the list. You are then prompted to choose a location. Depending on the job you choose, your relationship with the hold in that location may change. Talk to your recruit and say “Give me what you've collected from jobs”. The menu that opens can be used for taking any item from your recruit. Upon closing the menu, you will receive the gold reward (if any). Talk to your recruit and say “Follow me”. To send them back to the headquarters, tell them “Patrol the headquarters”. *Note: none of these commands will conflict with any additional follower mods. Talk to your recruit and say “Take a break from patrolling the headquarters”. Go to the MCM menu and start typing in your guild name. It will show up in the top-left corner of the menu. Talk to your recruit and say “I have something to tell you” and then “Sorry, but I have to let you go.” They will no longer be a part of your guild, and you must recruit someone else to take their spot. When you assign enough jobs, your guild will level up and, as guild master, you can choose certain perks for the guild. Every time your guild levels up, you will receive 1 guild perk point. You can then spend it on perks. Each perk has a unique effect on what kind of guild you are. If you have perk points to spend, then just click on the perk you want. you can change perks at any time just by reclicking them. Every time you assign a job, you are affecting the people and the world around you. So if you send your recruits on good-hearted jobs, people will like you more, and perhaps even lower prices for you. However, if you send recruits on jobs to steal from helpless old ladies or rip the hearts out of beggars, people won’t take too kindly to that, and, naturally, they will put a bounty on your head. You can see your reputation with a hold in the MCM menu. 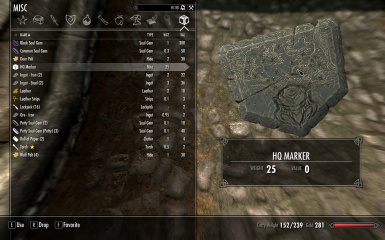 Custom Sigils by Hoax 2: create your own guild logo and display it on shields and cloaks! Placeable Statics by Iceburg: create and place any furniture(including banners) in your guild headquarters! Multiple Floors Sandboxing by Dovahklon: this mod allows your guild members to walk up and down stairs and between multiple levels when they are hanging out at the headquarters. Compatible with all follower mods. For some reason there is a myth out there that this mod isn't, but I assure you that it is. Now that that’s out of the way, EVERYTHING should be compatible with this mod. I have not experienced, nor had someone report an incompatibility. Recruits won't report your crimes. Relations(WIP) : now you can choose where you want your recruits to do their jobs. depending on where they do the job and what it is, you will either become friendlier or more hostile towards different factions. Combat Specialization: You can now change the way your recruits fight. For example, you can tell one of them to use ranged weapons and another to only use their fists! Unlimited Guild Levels: Your guild can now level up past level 10, to infinity. However, around level 20, it's nearly impossible. You can now dress your guild members in any uniform. Guild leveling: level up your guild by assigning jobs! With guild leveling, rewards are much more in depth.